Don't push it off till the weather is "perfect"
I've been putting off new tires and brake pads, and some cleaning on my bike for months. Just being miserable, not liking the way my bike looks, not liking the way my bike rides. I'm just ridding slowly, feeling embarrassed, being miserable. It might not be late enough, weather wise, but it is way to late maintenance wise. Don't put it off, work on your bike! Shifting not so crisp, clean your drive train, and tweak your barrel adjusters. Brakes weak, replace your pads and lube your cables. Bike looking gross and not inspiring you to fall in love with it everyday, give it a clean. Riding slow, taking turns like your walking on the edge of a cliff, put some new tires on! Creaking peddles or drive train, replace worn parts, and find out why you fell in love with cycling again. I hated my peddles, they were ugly, they creaked, they were worn out, so finally after months and months I got around to installing some Shimano SPD's. They're silver, and once I stripped the logo off they looked pretty good! This one little step, this one little improvement...and getting a second flat on my dirty worn out tires in a week, motivated me to keep going, to get my whole bike up to snuff. I'm lucky enough, or really smart enough to have bought a large utility sink, so i can really get in there with soap and water and get wheels clean! If the tires are in good shape I will leave them on and scrub the crap out of them. Lately I've taken to using the Super Soap we have for cleaning our hands and scrubbing the gum walls with that on some Scotch-bright pads! Oh so clean, you almost can't tell that they were black with road grime and making hate my bike for months! Nothing feels as good as mounting new tires on clean wheels, and knowing they're going on a clean bike with new brake pads. It's like the bike is new again. While replacing the pads I caught a real problem. My rear brakes squealed a bit in the wet, they always have, and I'm always adjusting them but the squeal is always coming back. While replacing the pads I noticed that on the squealing side the post come a little loose from the pad holder. Even though they were New Old Stock. I replaced the holder with one out of my used Mafac parts drawer and so far no squeal! I might have also saved myself a brake failure while bombing down a hill or something! I'm starting to see the Value in the new Compass one piece pad holders. I think they will be going on my bike soon! This reminds me that the best time to find a potential problem is while servicing your bike. That's why your mechanic is always calling you while your bike is in the shop. No matter how hard they look your bike over in the estimate process you find other things once your in there and inspecting the parts in your hand! But that's not the point, the point is, a tiny bit of work you put off can make you miserable, but just putting in an hour or two and a few new parts can make you fall in love with cycling all over again. Don't put it off, it's not worth it! Just look at all the dirt I knocked off my bike, most from under my fenders. You don't want to be carrying all that crud around. 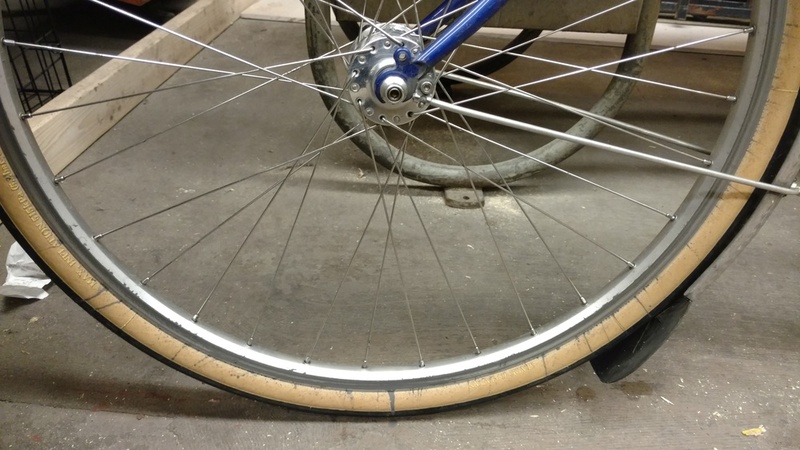 This happens all the time with people that hate their saddles, or don't want to spend money on fenders. I always tell them it's worth it, other saddles exist, rolling around in Portland's wet weather without fenders just isn't worth putting off spending a little money. Skunk stripes aren't cool, besides what else are you going to spend your money on? Fenders, and comfortable saddles will last for years, that bar tab, or latest gadget you don't really need is a waste! The only sad part is that it's still raining every day and my pretty Compass tires are already starting to get dirty.